Please REUSE your existing CABLES, connectors and other hardwares for your unit - Pride Mobility BAT "Gel Equivalent" 1003 Sealed """Gel Equivalent" Equivalent" Equivalent" 12 Volt 55 ah 22-NF Replacement Group 22NF Wheelchair Replacement Battery. We ship only replacement batteries. Please verify the batteries being ordered match the batteries in your unit prior to placing your order. We are not responsible for incorrect orders. 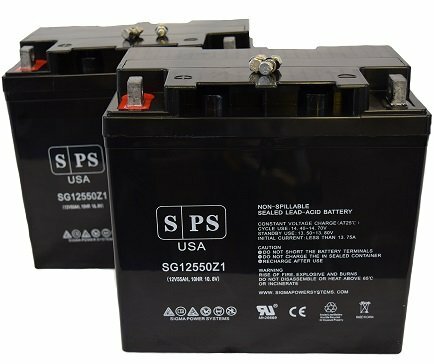 Shipment contains Two12V 55Ah SLA Replacement battery (SPS Brand) for Pride Mobility BAT"""Gel Equivalent" Equivalent" Equivalent"1003 Sealed """Gel Equivalent" Equivalent" Equivalent" 12 Volt 55 ah 22-NF Replacement Group 22NF Wheelchair Replacement Battery. Batteries supplied by RightPrice Batteries for Pride Mobility BAT"""Gel Equivalent" Equivalent" Equivalent"1003 Sealed """Gel Equivalent" Equivalent" Equivalent" 12 Volt 55 ah 22-NF Replacement Group 22NF Wheelchair Replacement Battery are of high quality, designed to meet or exceed original OEM specifications. They were manufactured by ISO certified companies. Spent batteries from Pride Mobility BAT"""Gel Equivalent" Equivalent" Equivalent"1003 Sealed """Gel Equivalent" Equivalent" Equivalent" 12 Volt 55 ah 22-NF Replacement Group 22NF Wheelchair Replacement Battery have to disposed properly as per local and federal regulations. Ask about our free battery recycling service. Replacement batteries for Pride Mobility BAT"""Gel Equivalent" Equivalent" Equivalent"1003 Sealed """Gel Equivalent" Equivalent" Equivalent" 12 Volt 55 ah 22-NF Replacement Group 22NF Wheelchair Replacement Battery carry one year full warranty and 30 days money back guarantee. Pride Mobility BATGEL1003 Sealed GEL 12 Volt 55 ah 22-NF Replacement Group 22NF Wheelchair Replacement Battery has one year warranty when used under normal conditions.